A Firefly is lighting up operating rooms, making it easier for robotic surgeons to remove tumors. However, this Firefly is not the type that children catch in a jar during warm summer evenings. Instead, it’s a technology that uses a wavelength of light not visible to the human eye. A special dye is then injected which causes a bright green fluorescence of certain tissues, hence the name “Firefly.” This green glow lets surgeons clearly see the difference between cancerous and healthy tissue when performing surgery, allowing them to remove the tumor while saving the rest of the healthy organ. 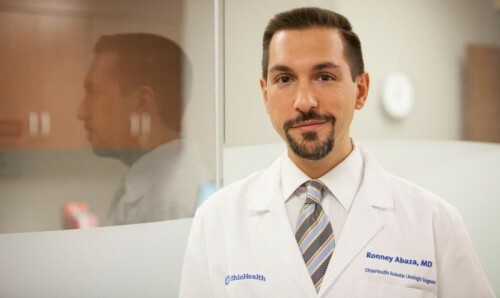 OhioHealth urologic robotic surgeon Ronney Abaza, MD, is a pioneer in the use of this technology. It was developed primarily for use in robotic kidney tumor surgery, an application for which Dr. Abaza published the first research on optimal dosing of the dye to allow for the best visualization of tumors. Roni Leeman is a patient of Dr. Abaza’s who was able to keep most of her kidney following surgery using Firefly. “When I was in training, we would have removed her entire kidney. Nowadays, even with the tumor as large as she had, we can save the kidney, number one, and number two, we can still offer her a minimally invasive surgery,” said Dr. Abaza. While the Firefly technology (technically called “near-infrared fluorescence imaging”) is fully integrated into the robotic surgical system, most surgeons have not used it because of inexperience in proper dosing of the dye. No patients have had any side effects from use of the dye. The technology gives the surgeon additional information that cannot be seen with the naked eye, which is a model for integrating other information sources such as imaging studies into what the surgeon sees during an operation. To learn more about Dr. Abaza, click here.